Summer is coming...and as we all know, kids and water go together like peanut butter and jelly. Or almond butter and jelly, for those of us with a nut allergy. It’s like our little people are magnetically drawn to the water. But when we don’t prepare our kids for the realities of water play, things can get dangerous, and drowning becomes a real threat. In 2012 California lost 62 children under the age of 14 to drowning deaths, 70% of which were children under the age of five. And while drowning casualties have been cut in half since the late ‘90s, thanks to laws requiring fencing around pools and covers for drains and spas, childhood drowning still remains the leading cause of injury-related deaths in California. 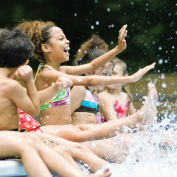 Any progress in swim safety is good, but we still have to protect our kids with layers of safeguards to make sure our children are prepared to swim, play, and enjoy our pools and waterways safely. Start young to minimize your child’s risk of drowning, and maximize the benefits swim lessons will have on their life. Even the best parents can’t watch children every moment of every day, and they wander far and fast as they become more independent. The best way to safeguard against a water related accident is to get them in the water with a certified swim instructor and teach them to swim as early as possible. Young children are more likely to drown in a pool or hot tub, so teaching them emergency water safety is the main concern. Swim lessons starting from a very young age serve to prepare kids to stay calm if they do fall into the water, and teaches them the skills to get safely to the edge. Choose swim lessons offered by a well respected health club, taught by experienced instructors who are WSI (Water Safety Instructor) and ASI (Aquatics Swim Instructor) certified by the American Red Cross. Simply knowing how to swim to safely to the edge of a pool is not enough to prevent drowning in older children. As our little ducklings wander further from the nest the dangers become greater. Older kids are more at risk of drowning in lakes and rivers where the edge of safety is farther away and strong currents may make swimming difficult. This is especially important given our location in the Sacramento Valley and Foothill areas. The Sacramento and American Rivers, Folsom Lake, and Lake Natoma are just a few popular places our families and teens go to cool down when the weather gets hot. At this age, developing strong swim skills and continuing to instill a healthy respect for water are the most important lessons. Choose swim classes to help develop strong and efficient strokes and endurance in the water. Even learning CPR skills make kids safer and less likely to experience trouble around water. And as always, continue to talk to your kids about the dangers of drowning. It’s our job as parents to make sure they have all the skills and knowledge to be safe this summer.